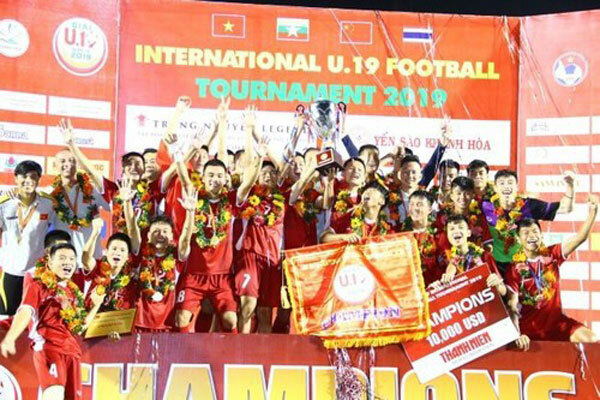 Việt Nam’s U19 side have won the International Football Championship. A Phạm Xuân Tạo strike on the hour mark was enough to seal the win over Thailand on Saturday night in Nha Trang City. It was the second time Việt Nam have beaten rivals Thailand in a week after their 4-0 victory at the Asian U23 Championships. Thailand started the game well, clearly irked by the country’s earlier defeat, but with great support behind them, Việt Nam defended well and managed to take control of the game during the first half. On 60 minutes they finally broke the deadlock. Long Nhật’s long ball put Tạo through on goal and he rounded Rakyart in the Thai goal to coolly finish into an empty net. Tạo, who finished the tournament joint lead scorer and most valuable player, thought he had doubled Việt Nam’s lead on 75 minutes but his effort was judged offside. As the clocked ticked, Thailand did have chances to get back into the game but were denied by the woodwork and brilliance of Vietnamese keeper Quan Văn Chuẩn, who was named goalkeeper of the tournament. As well as lifting the trophy, Việt Nam also picked up the Fair Play award. In the third-place match China beat 10-man Myanmar 3-2 ton grab the bronze.